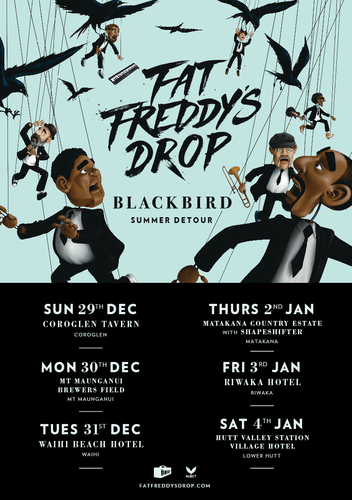 Fat Freddy’s Drop are primed to present the Blackbird Summer Detour, escaping along local highways and byways to bring the live music experience home to New Zealand. Blackbird Summer Detour kicks off in Christchurch early December before hitting Coroglen, Mt Maunganui, New Year’s Eve at Waihi Beach, Matakana, Riwaka and Lower Hutt. With studio album ‘Blackbird’ soaring with critics and fans worldwide, and Freddys selling out tours in Australia, UK and Europe, the concerts promise to be formidable affairs. “We'll definitely be turning up the heat. Freddys love responding to the energy of the audience and the New Zealand summer crowd is super rowdy! ", saxophonist Chopper Reeds aka Scott Towers said. The Christchurch show holds a special place for singer Joe Dukie aka Dallas Tamaira who has family connections to the city. The band played Mud House Winery on the last summer tour down south, and prior to that performed at The Civic that has since been demolished following the Canterbury earthquakes. "I'm looking forward to playing in Christchurch again. They've been going through some hard times and we'll be digging deep to bring some Freddy goodness for the people there”, he said.